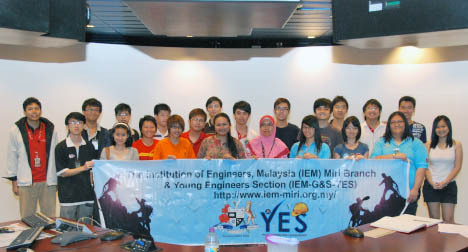 13th April 2012, Fri - Young Engineers Section (YES) of The Institution of Engineers Malaysia, IEM Miri Branch in collaboration with Curtin Engineering Club (CUTEC) had successfully organized a half-day Technical Visit to SHELL Ace Virtual Reality Centre in Sarawak Shell Berhad. A total of 20 students from Curtin University of Technology, foundation to final year students participated in the visit. The event objectives included promoting networking among new and existing senior year’s students as well as exposing participants to the actual working environment learnt as theory in the classroom. In addition to this, the students involved in organizing event, has a chance to learn from the organizational experience/skills of YES graduate members. The CUTEC organizing Vice-chairperson Sdri. Conie Choo, and YES Vice-Chairperson Ir. Tiang Kwong Hwo, gathered the group to the mustering point at 8 a.m. The event started with a safety briefing then an introduction by a Shell Professional Engineer who was also an excom member of IEM Miri Branch Ir. Hanisah Han (Mechanical Engineering). Ir. Hanisah Han presented and demonstrated the various eye opening advanced features and functionalities of the Virtual Reality Centre. The session included interactive sharing and gave opportunity for students to ask about careers in mechanical engineering, geology, and engineering in general. Volunteers from Young Engineers Section and CUTEC coordinated the event throughout the event flawlessly. At the closing of event, CUTEC presented souvenir to the speaker and ended the event at 12 noon with a group photo.